Refugio Paz de las Aves is an amazing place to bird. Though I have already written one blog post detailing the most amazing birding experience I have ever had there are still many more birds to describe. I understand now why when Mike returned from Ecuador he did one post each on the hummingbirds, antpittas, and feeder birds he encountered as Refugio Paz de las Aves. The only way for one’s mind to still function after a visit to Refugio Paz de las Aves is to chop the experience down into smaller chunks or one might end up rocking back and forth with drool running down one’s chin muttering about “The birds…the brilliant colorful birds” until someone with a straitjacket comes and takes one away for good. Seriously. The birds are that awesome. How about two, count them, two species of quetzal? The bird over on the right is a Crested Quetzal and the one below is a female Golden-headed Quetzal. The two of them combined had me really regretting leaving behind my digiscoping rig while we walked the trails at Refugio Paz de las Aves. 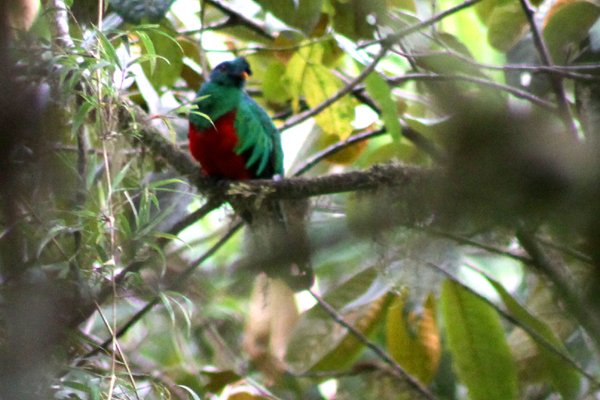 Especially when I think about how before seeing these two birds I had never seen any quetzals. But I am not sure if you jaded birders will accept a mere two quetzals as evidence of the magnificence that is Refugio Paz de las Aves. It’s a good thing that there are more birds to share! Though we didn’t get disgustingly close views of magnificent feeder birds like Mike did because many trees held fruit that were more tempting to hungry birds than fruit on a feeder we still spotted Toucan Barbets, Emerald Toucanets, Blue-winged Mountain-Tanager, Beryl-spangled Tanager and a host of other gorgeous birds. 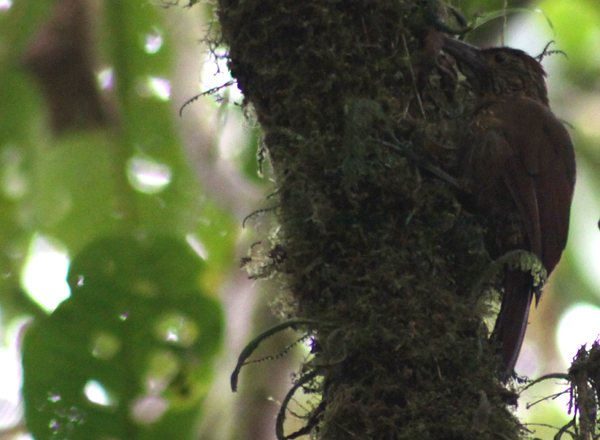 I particularly liked seeing a Strong-billed Woodcreeper, the largest of the woodcreepers and an impressive creature even if it lacked the flashy colors of the more charismatic species. What it lacks in colors it makes up for in the length of its scientific name. Try saying Xiphocolaptes promeropirhynchus three times fast! Still not convinced as to the splendor of Refugio Paz de las Aves? How about another antpitta? Below is Susan, a Moustached Antpitta Grallaria alleni who, like Maria the Giant Antpitta, came in for worms. And, of course, there are the hummingbirds. While at the feeders we identified ten species, including stunning birds like Booted Racket-tail, Empress Brilliant, and Velvet-purple Coronet. None were as cooperative for me as this female Fawn-breasted Brilliant, however. 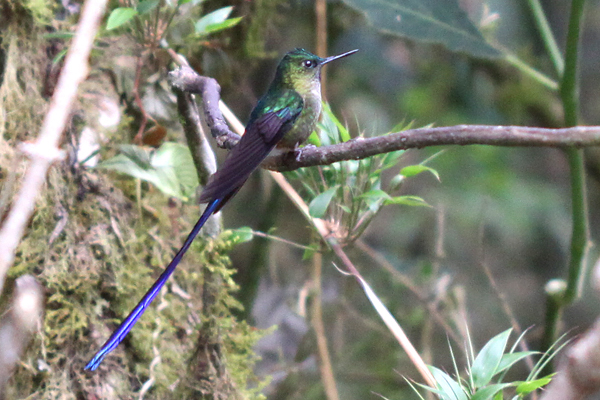 More beautiful than any of the above were the Violet-tailed Sylphs, of which the tail of one is up at the top of the post. Words fail me when describing the shocking variety and quality of hummingbirds we saw, and a bird as flashy as Aglaiocercus coelestis does not help me with my inability to convey in words the wonder I felt at such absurdly awesome creatures. The long, violet tail, the iridescent green stripe that runs from the base of the bill up and over the top of the bird’s head, the blue on the throat, the sheer magnificence of this bird is impossible to convey. My images don’t really do the bird justice either. You will just have to go to Ecuador and see for yourself. Well, according to Patrick’s most recent post, Ecuador is just like winter birding in New Jersey. 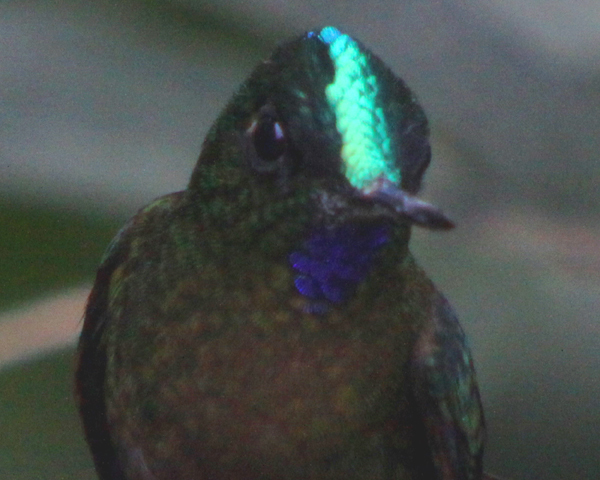 Birds of the Choco cloud forest are so incredibly fantastic. I can still hardly get over the fact that Moustached Antpitta (a species that was at one time so little known that it was believed to be critically endangered) can be so easily seen and photographed! This site is simply amazing for all of the information given of the bird varities. In a time when most can not afford to travel to enjoy the actual sights, and-sites…we are so fortunate, with INFO SITES, as this. The beauty of the hundreds of varities and their habits, throughout all seasons, by tracking them, we know how VITAL it is to ALL OF THE WORLD, TO PROTECT- OUR EARTH..AND IT’S BIRDLIFE HABITATS. Understanding ‘how the habitat dots- connect’ , we come to know, better, the areas that are so critical for us to-PROTECT. THANKS TO EVERYONE FOR THE INFO, AND PICTURES!! 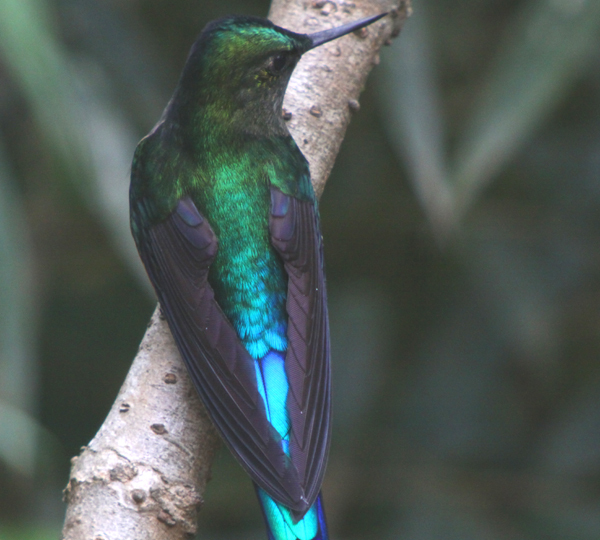 What gorgeous pictures of the Violet-tailed Sylph!s! 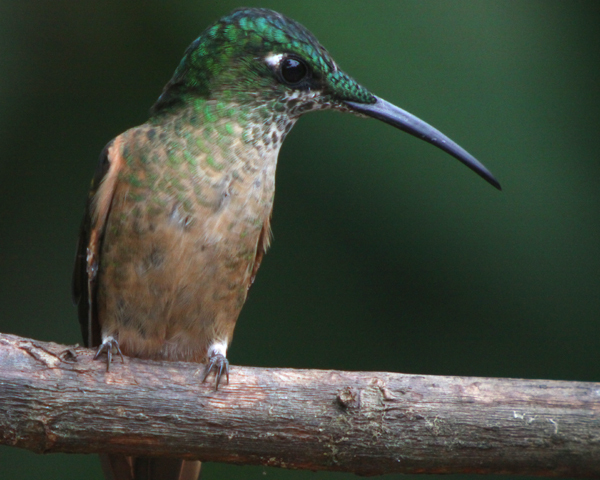 Were these seen at hummingbird feeders at your hostel or just by chance in the forest? I will definitely use your blogs when I plan my trip to Ecuador this spring. @Pat: You think you could hardly get over the antpittas being that easy? I nearly soiled myself! @lindaclarice: Thanks for your kind words. @Yourbirdoasis: At hummingbird feeders at Refugio Paz de las Aves.